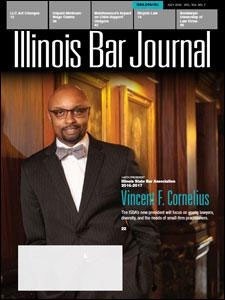 NIU College of Law alumnus Vincent F. Cornelius, the first African American to serve as president of the Illinois State Bar Association, is profiled in the July 2016 issue of the Illinois Bar Journal magazine. Digging beyond his professional career as an attorney and his goals for the ISBA presidency – “working to brighten the future of young lawyers, advocating for diversity and inclusion in the profession, and offering relevant continuing legal education for small-firm members” – the story also explores his childhood in Joliet. Cornelius recently delivered the keynote address at the NIU Law commencement ceremony.